NASA's mission to study the interior of the Red Planet is scheduled to launch Saturday, May 5 at 4:05 a.m. Pacific (7:05 a.m. Eastern). It will be the first planetary mission to launch from the West Coast. The InSight launch blog reports that meteorologists predict a 20 percent chance for favorable weather at Vandenberg Air Force Base Space Launch Complex 3. The launch may be visible between Santa Maria and San Diego, Calif, provided the weather is clear. If you are interested in watching the launch in person, NASA's Jet Propulsion Laboratory has a website to guide you. InSight's launch window is open from May 5 to June 8. As long as it takes off during this period, InSight will land on Mars on Nov. 26, in a region called "Elysium Planitia." This flat, smooth plain was chosen as it's considered a relatively safe landing site. 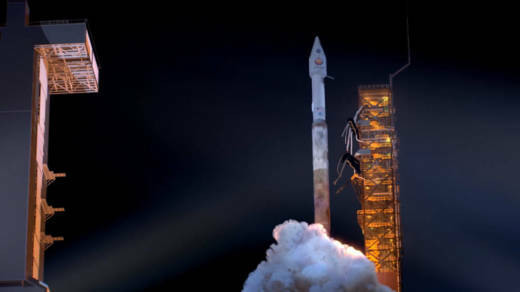 NASA's next Mars mission, InSight — designed to probe unseen depths on the Red Planet — has passed its latest check up and is readying for a spring launch. The lander passed the crucial test of unfolding twin, origami-like solar panel arrays on January 23. 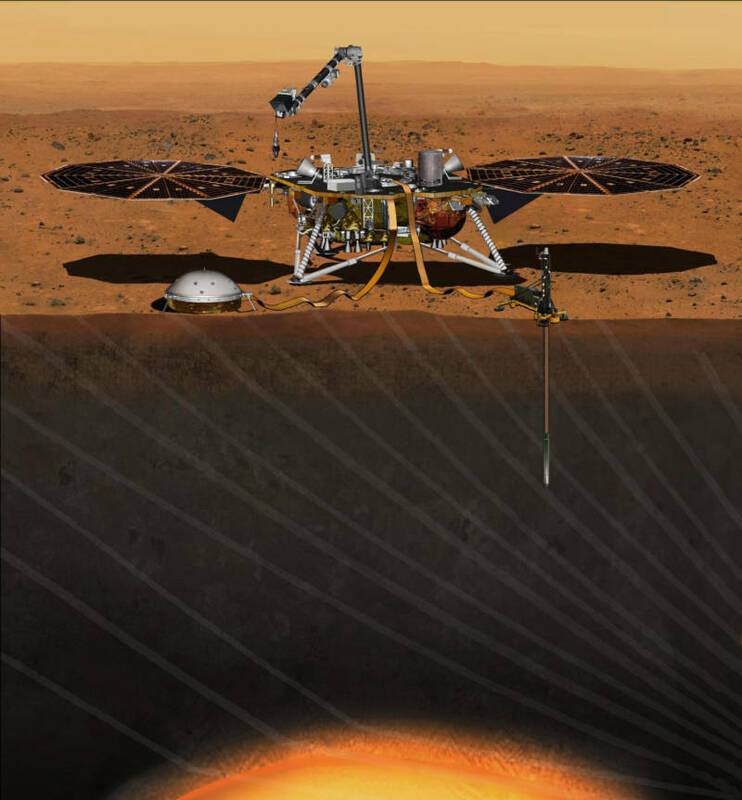 Under illumination simulating Mars' relatively weak daylight, InSight generated ample electrical power to run its systems. With a planned May launch fast approaching, and a landing expected in November, engineers are busy putting the robot through its final readiness tests to ensure its survival in the remote wilderness of Mars. So far, all systems go! Unlike past missions, InSight (Interior Exploration using Seismic Investigations, Geodesy, and Heat Transport) will focus on the interior of Mars, and not merely send us pictures of sculpted desert landscapes or analyses of Martian minerals scooped off the ground or drilled from rocks. Those are aspects of Mars' outer surface, which represents only a tiny fraction of the planet's overall physique— so, one could argue that we know as little about Mars as medieval physicians knew of the human body, before they began probing inward with surgery. To get under Mars' skin, InSight will use an unusual set of scientific instruments, called SEIS, HP3, and RISE. SEIS (Seismic Experiment for Interior Structure) is a seismometer that will listen for tectonic vibrations caused by possible Marsquakes, magma movement, meteorite impacts, and the gravitational influence of Mars' larger moon, Phobos. How vibrations move through Mars can yield clues about its interior structure and composition. So, imagine that medieval physician putting an ear to a patient's chest or stomach, and learning something about the location and function of heart and stomach by what they hear. HP3 (Heat Flow and Physical Properties Package) is a burrowing probe that will tunnel as deep as 16 feet below the surface, pulling a string of temperature sensors behind it. The sensors will measure the rate at which heat flows out of Mars to the surface. Measurements from HP3 will give insight into the history of heat escaping from Mars — how quickly the core and mantle have cooled, and how this may have shaped the volcanic and tectonic evolution of the planet. Borrowing again from a medical analogy, modern forensic medical examiners use measurements of body core temperature to estimate time of death. 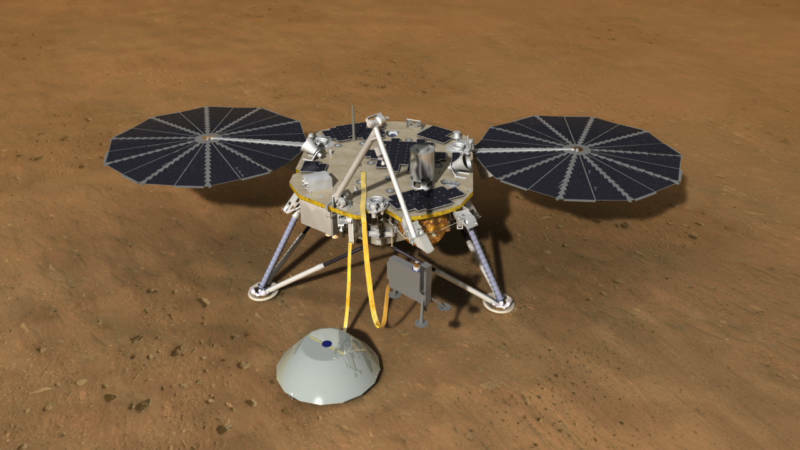 RISE (Rotation and Interior Structure Experiment) will measure the shift in frequency of InSight's X-band radio waves to make precise measurements of motion — the motion of the lander, and by extension the Martian surface it rests on. RISE will look for small "wobbles" in Mars' rotation, telltale "shimmies" that provide clues about its internal structure — not unlike how a washing machine in its spin cycle may vibrate or wobble in a particular way depending on the weight and balance of the laundry inside. 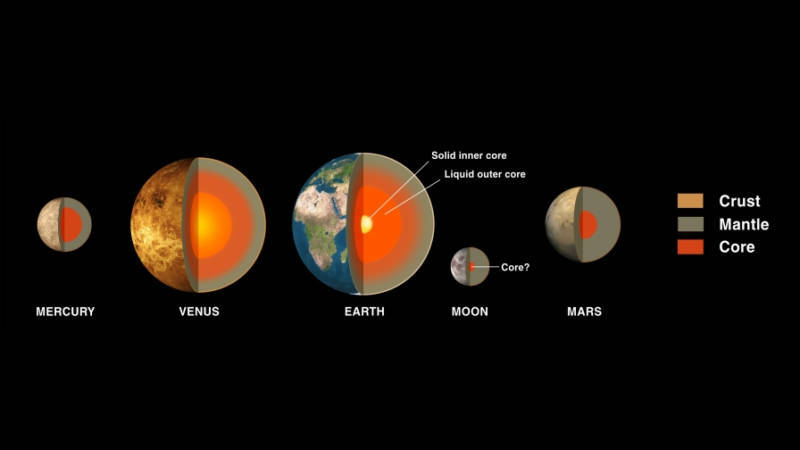 Combined with other measurements of Mars' rotation made by earlier missions, the size and composition of this planet's core may be deduced providing a window into how not only Mars, but all the rocky planets formed. Rounding out the medical analogies, the technique used in RISE may be likened to a medical Doppler ultrasound, which uses the shift in frequency in sound waves to measure motions within a body. But that's only an analogy, so don't work it too hard. . . .
Each lander or rover that has set down on Mars has offered something new in our understanding of our neighboring planet — and even though their investigations have been limited to Mars' surface, their discoveries have been colossal. 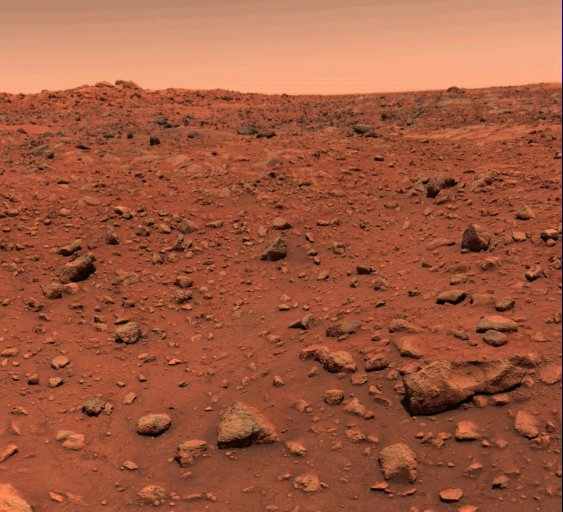 The twin Viking landers gave us our first pictures from the surface — something that we are now very familiar with, but which was an epic event in 1976. The Sojourner rover, the first mobile lander, was able to travel to selected rocks and analyze their composition, the way a human geologist might move around a landscape investigating points of geological interest. The Mars Exploration Rovers (Spirit and Opportunity) prospected over wide ranges with rock drills and microscopes to paint pictures of Mars' watery, probably more Earthlike past. The Mars Science Laboratory (Curiosity) took on the challenge of scaling a mountain to investigate layers of sedimentation laid down over billions of years of Mars' history, further opening the window to a young Mars possessing rivers, lakes, and seas of liquid water. Scientists are by no means finished exploring Mars' surface — there's still a lot it can tell us. But with InSight, they will now be able to peel back the skin and get a peek at Mars' guts.